The mCar is a demonstration and marketing platform for MPS hardware. It integrates MPS power and motion control components in a real, large scale system that allows MPS teams to implement and test hardware and software on a challenging application. The design and mechanical functionality of the vehicle showcases the broad set of components that MPS manufacturers. mCar was fully developed and fabricated in-house at MPS. 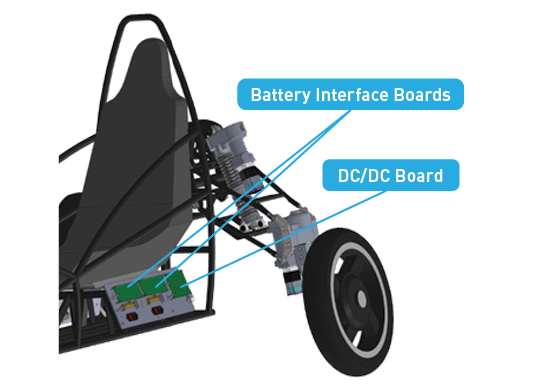 The primary components of the electrical hardware to highlight on the mCar are the eMotionTM components. 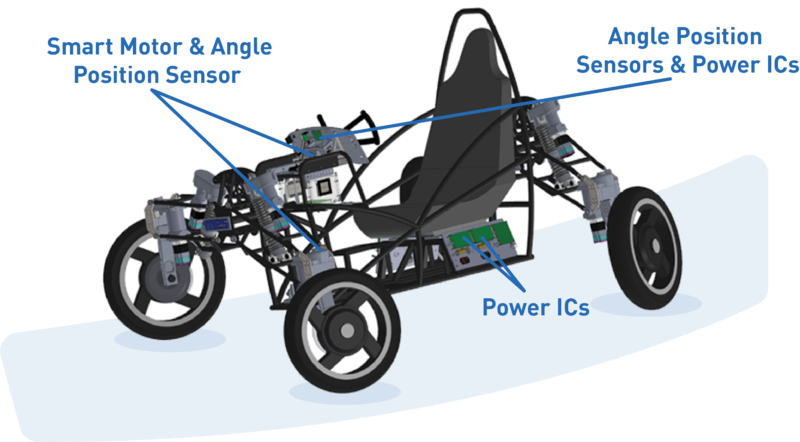 The brushless-DC motor control modules (MP6570) that are used for the steering and shock actuation and the magnetic angle sensors (MA702) that are used in the steering wheel, foot pedal, frame pivot, and final steering axis output sensing. Beyond the eMotionTM components, there are also voltage converters and regulators, power drivers and several other ICs that are utilized in the MCU, battery support and communication subsystems.